Only a few pages in I realise that this is something special. After a chapter I’m hooked, and halfway through I am of the firm opinion that Mr Palomar by Italo Calvino is the pinnacle of anything that has ever been written. Mr Palomar is a fictional someone who spends his time looking and thinking about stuff. His thoughts/observations/adventures are recorded by Calvino in the book that bears his name. Page by page I marvel at the ideas, descriptions and language used. This makes me even more painfully aware of the shortcomings in my own writing. Not that I aspire to be any sort of literary figure I hasten to add! 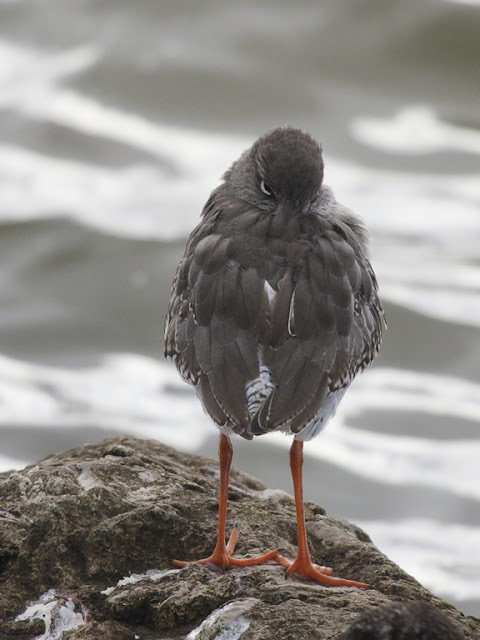 I am just a regular guy who takes regular pictures of the regular birds on his regular patch, then blogs about it. What Mr Palomar has done is make me look at the Patch in a different way, a much more detailed one. To stare until a place that I am so familiar with until it becomes strange and almost alien (this kind of reaction might not have been Calvino’s aim when writing the book, but it is what I have taken from reading it). I am at a lucky loose end one afternoon and I decide that I will take my camera and my copy of Mr Palomar on to the beach and see what happens. I going to stay until I have seen all I can possibly see on the shore. 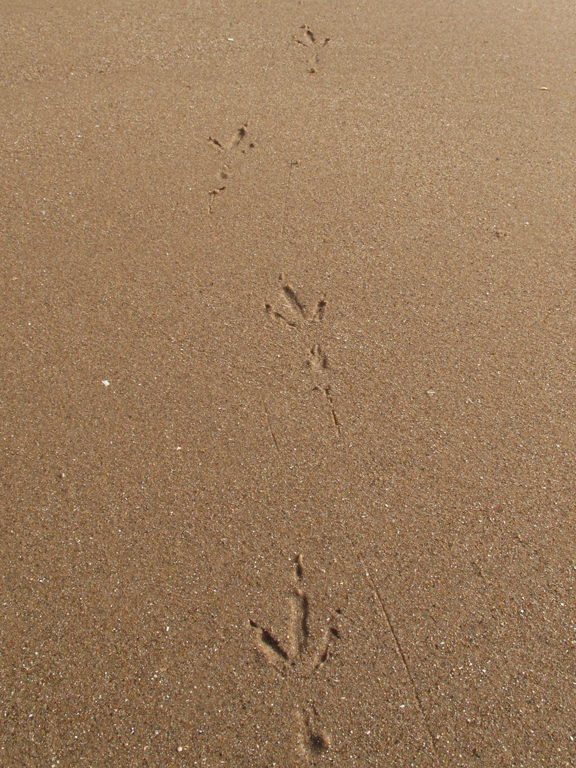 I don’t mean species-wise here, I’m not about to make a list of the birds I see and leave, I’m going to remain until I have observed the beach and can’t take in any more beachy information. From the lake I move on to CaldyShore heading towards Thurstaston. In the corner of this beach, nearest the sailing club, there are always lots of washed up bashed up shells. The flow of the tide, its direction influenced by the construction of the marine lake, seems to deposit then crush them here. A sand factory on the shore. 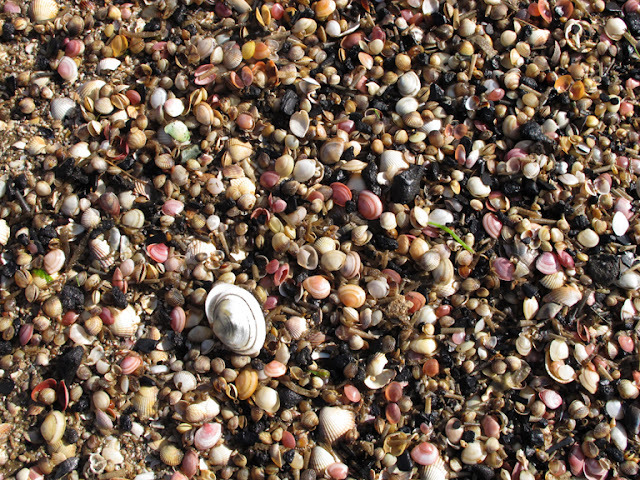 I take a few pictures of this soon-to-be-sand pile of shells. The beach is blighted by a couple of irresponsible dog walkers (I have nothing against dogs or their owners in general, just the selfish and lazy ones). I figure I will have to put up with them as far as Caldy Steps, the beach after this point tends to be much quieter. I avoid the soft hazards they knowingly leave behind. 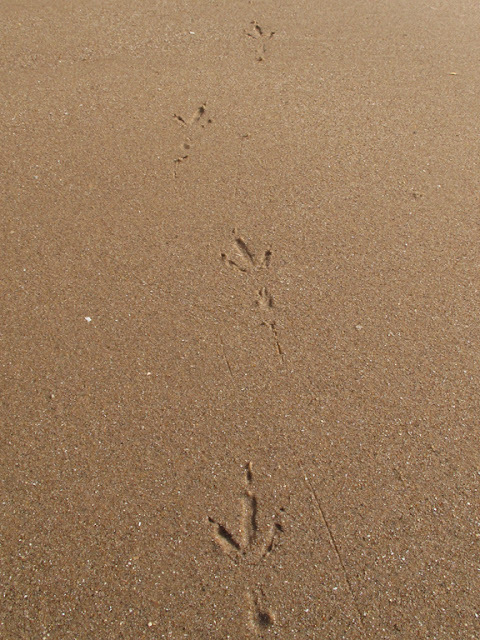 Sure enough, past Caldy Steps the foot prints of canines and their walkers are replaced by the claw prints of wading birds. A Kestrel glides in, low over the rock armour protecting Caldy Golf Course, then floats up to a hunting hover. I’m close enough to see the minor adjustments it makes to tail and wing so it remains stationary in the strengthening breeze. 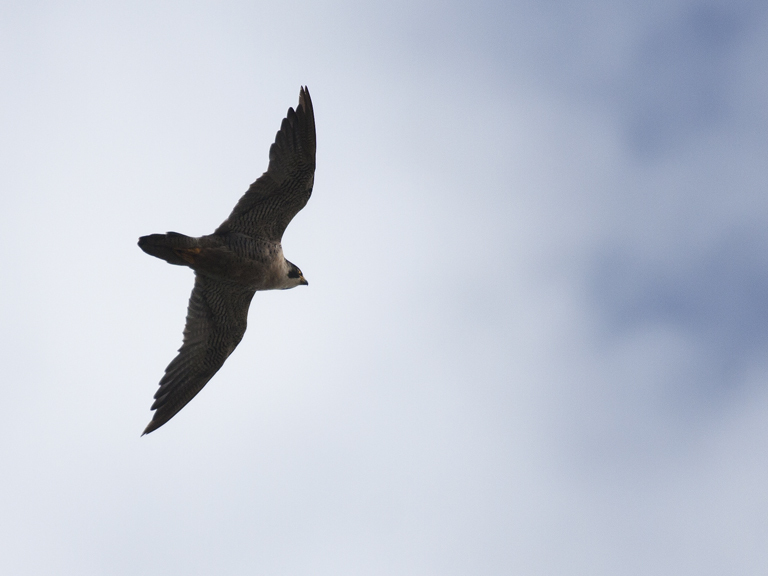 It has adopted a position that looks like it has been frozen mid dive– not a classic hover with quivering wings and paddling tail. Instant custard coloured talons are folded away like undercarriage on a taken off plane. 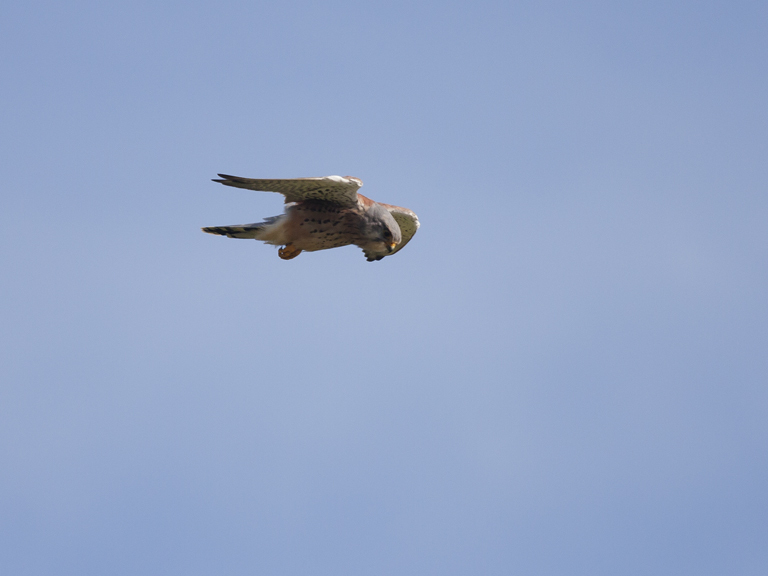 The Kestrel plunges on something in the long grass and disappears off to eat its afternoon snack. It is replaced almost immediately by a Peregrine. It soars in from the direction of Thurstaston, surveys the mudflats, spooks the waders and then heads off towards Hilbre leaving the skies above me predator free. The wading birds return to quiet feeding. 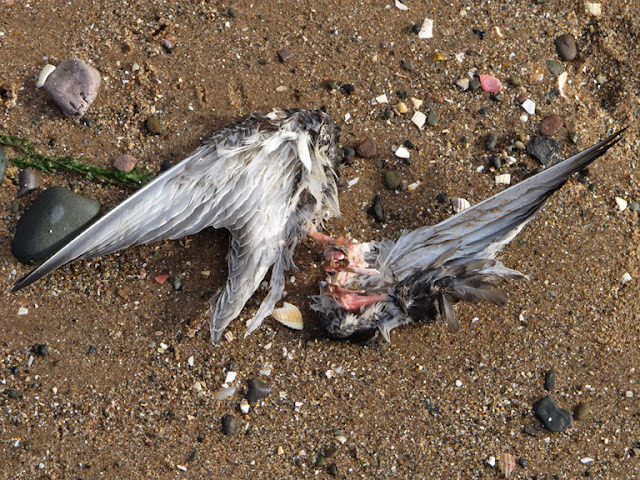 Further down the shore I come across some evidence of the Peregrine’s grim efficiency. 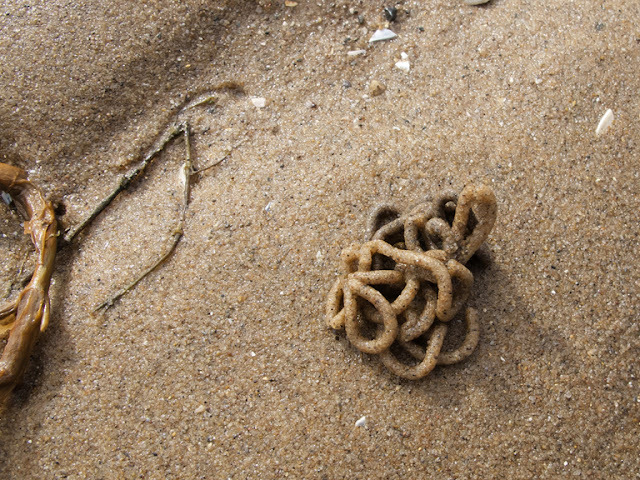 Just the wings remain of a Knot, its body devoured. The layers of fat it put on to fuel its migration now sustaining the Falcon, nourishment for the estuary’s top predator. I look at the severed wings for some time, prod them with the toe of my boot. I’m wondering how many miles they had propelled the bird, over how many borders and which countries they touched down in before its demise. Moving along the beach I come across a convenient backside-sized boulder in the midst of some seaweed strewn sea smoothed sand. I park myself on it and enjoy some warm sunshine on my face. Dotted around the wet sand are the casts made by rag worms. I look at the one closest to me. I ask myself what it looks like. I look really closely. I can see the individual grains that make up the cast that lies coiled like toothpaste squeezed from the tube. It doesn’t look like toothpaste though, after some more staring I come to the conclusion it resembles overcooked wholewheat spaghetti. To the left of the spaghetti field is a braid of channels carved into the mudflats by surface water run-off accumulated after the recent deluges that doused the Dee. Some of the channels are still flowing with water, percolated through cliffs and pebble beds, delivering freshwater to the salty flats. Other wider, flatter flows are now dry but you can still see the extent and the course that this miniature delta followed. I start to examine this new geological feature in some detail. The little creeks start to look like the Grand Canyon shrunk to a few square yards, the gurgling run-off cast as the Colorado River; it plunges over mini cliffs and erodes bends in the soft muddy banks of the shrunken gorge. The now dry, wide and shallow expanses that border the canyon take on the guise of a desert, barren and windswept like the Namib. Occasional pebbles stand like the stacks of MonumentValley. When the tide comes in and inundates this area my Grand Canyon will be transformed into an ocean trench, deep and dark while the Namib will become an abyssal plain scoured by the cloudy waters of the Dee. I’m rather pleased with this imaginary land I have discovered but it feels like there is something missing. 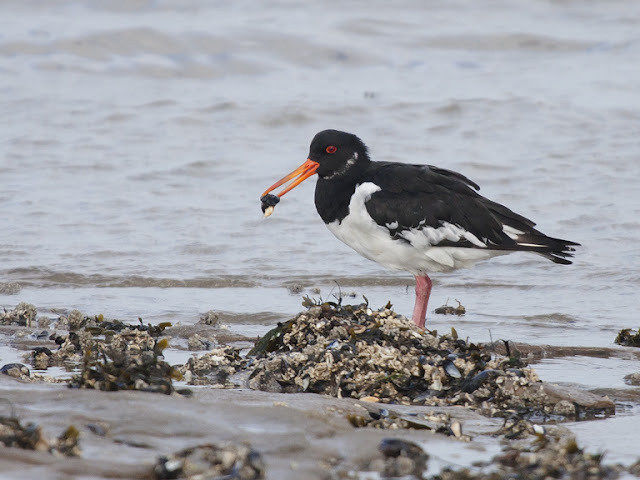 It is lifeless until an Oystercatcher wanders into the rocky area just before the mini Coloradoreaches the main permanent gutter draining this part of the flats. Now the picture is complete, my imaginary world populated. The Oyc fiddles around in the stones until it finds a mussel, prises the shell open then polishes off the pinky-orange lump inside. On a boat moored in the channel a motor is ripped into noisy life and I’m snapped back to reality. I look at my watch and wonder where the last hour and a half went. 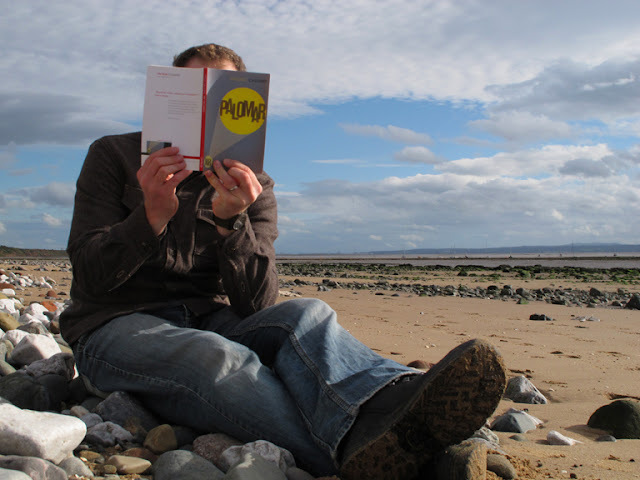 I glance up and down the beach, close my well thumbed copy of Mr Palomar, stow my camera in its bag and go home. Excellent piece of writing, and it made me buy Mr Palomar too!